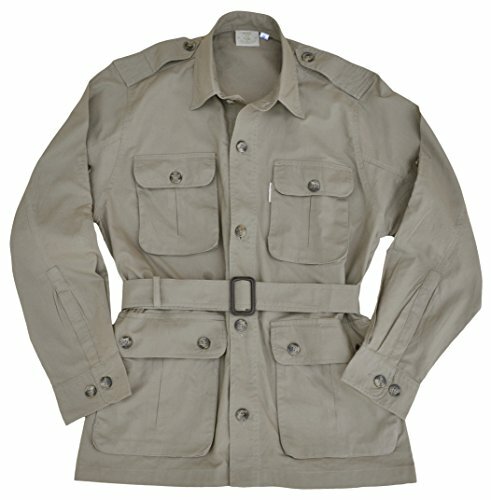 Safari Jacket for Men is constructed from light weight 5 1/2 ounce cotton fabric. Layer over a T-shirt or hunting shirt for cool comfort. Two buttoned flap covered chest pockets and two cargo pockets at the waist provide ample storage for essential outdoor gear. Cross-stitched epaulettes keep a pair of binoculars or a canteen from sliding off your shoulder. Functional Swiss tabs keep sleeves neatly rolled up. Full buttoned front and belted waist for a classic safari look. Not your grandfather's heavy jacket. Made in Africa from garment washed and pigment dyed cotton. Generously sized for comfort. Worn alone or over other clothing, this men's safari jacket is an authentic original and the choice of explorers, trackers, guides, and big game hunters the world over. If you have any questions about this product by Tag Safari, contact us by completing and submitting the form below. If you are looking for a specif part number, please include it with your message.